Barack Obama, Michelle Obama and Chance the Rapper appear at the Obama Foundation Summit. The summit was held in Chicago to gather young civic leaders around the world. 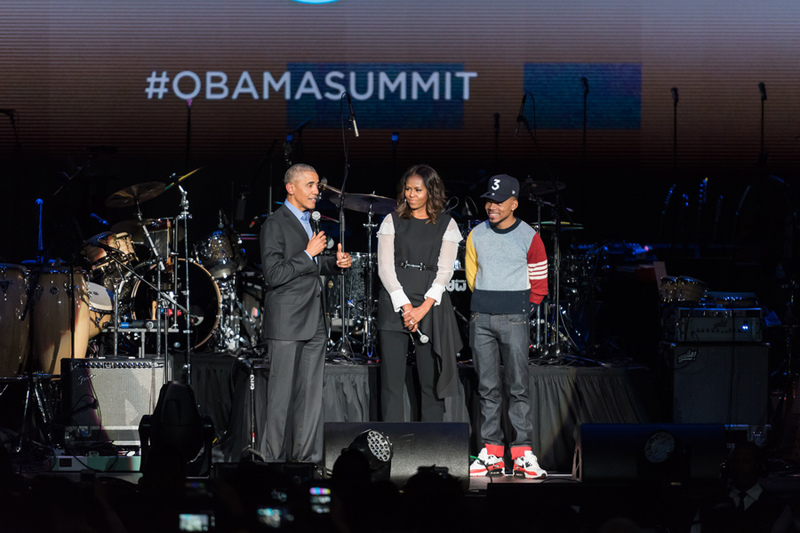 CHICAGO — Former first lady Michelle Obama and artist Chance the Rapper — two Chicagoans — embraced each other on stage Wednesday before kickstarting a concert to celebrate Chicago and young leaders the Obama Foundation Summit brought together. The concert was open to the public, attracting roughly 2,000 people to the Wintrust Arena. The event wrapped up the Obama Foundation Summit, a gathering for young civic leaders across the world to share ideas. Artists like Gloria Estefan and The National performed, each sharing their memories of Chicago in between songs. After a string of performers and celebrities –– Andra Day, Estefan, Nas, Aziz Ansari, Lena Waithe and Brandi Carlile –– Chance appeared on stage for the grand finale. Chance told those who attended that former President Barack Obama approached him to curate the concert. “We got some good work that’s going to start here in this city and going to radiate change a lot just like Chicago always has changed history,” he said. During his set, Chance also brought Francis and the Lights on stage to perform “May I Have This Dance.” Together, the two artists danced on stage in sync with flashing lights. As a second surprise, he harmonized with Lin-Manuel Miranda on “Dear Theodosia” — a song he performs on the The Hamilton Mixtape. At the event, Michelle Obama told audience members Chicago has an “amazing” array of resources, culture, talent and history, which will help support the foundation. Barack Obama joined her in reflecting on the past two days of the summit and the young people he had met. All around the world, he said, there are individuals who are trying to make a difference. “If you needed any kind of inspiration, listening to these young people over the last day and a half will tell you that as bleak as sometimes things look and as frustrating and as angry as you may get sometimes, there is a whole lot of hope on the horizon,” he said. Barack Obama said the foundation’s goal is to train and connect next-generation leaders with one another so that they have the network and resources to make an impact. This goal, he added, will be a “labor of love” that he will continue to work on for the next “20, 30, 40” years. Medill senior Griselda Flores told The Daily it was “ground-breaking” to see the Obamas back in Chicago, supporting a city that has a “bad” reputation for crime and poverty.